I love creating art! The design request was for a tree, with two birds, one for each daughter. I really love creating art for pregnancy! Henna design blended a lotus blossoming with a bird family - a family of 4, soon to be 5. I have been adorning women with henna nearly 15 years now, and I feel so grateful to have had this opportunity as an Artist, to find my medium and express it. I actually learned how to henna during my 3 year stay in Hawaii. I bought a kit, read the instructions, and never took a henna class. My journey as a henna artist has been a unique one. I found the medium of henna in 2003, and then met the people that would become my family in 2004. My experience of henna & family are so intertwined. I created many rituals to bond us together and henna often marked all of us. I love how dark it can get on the palms. 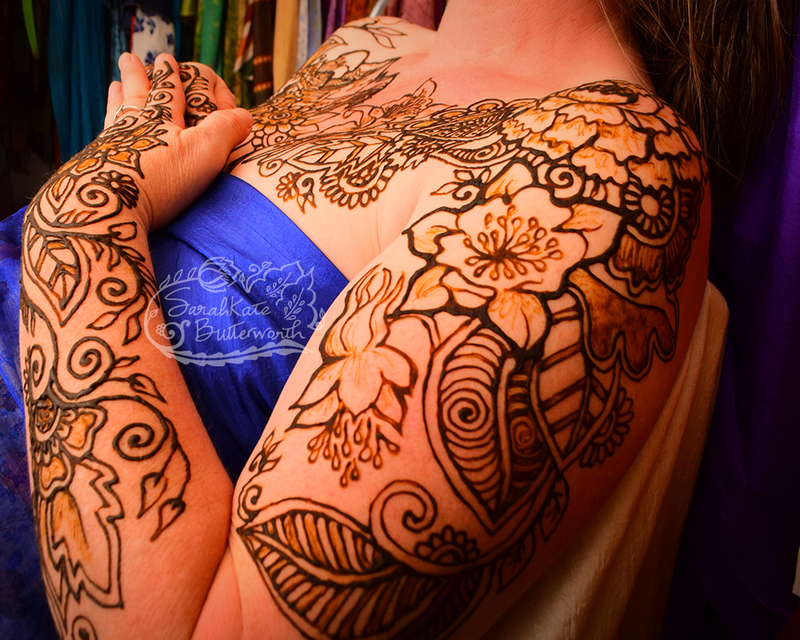 The skin is so thick there, it can really absorb a lot of henna's natural dye. This photo is of my palm & Laurel's. Natural henna goes through many color changes. It comes out of my applicator a dark green / brown and dries dark brown. Very light applications of henna dry orange. 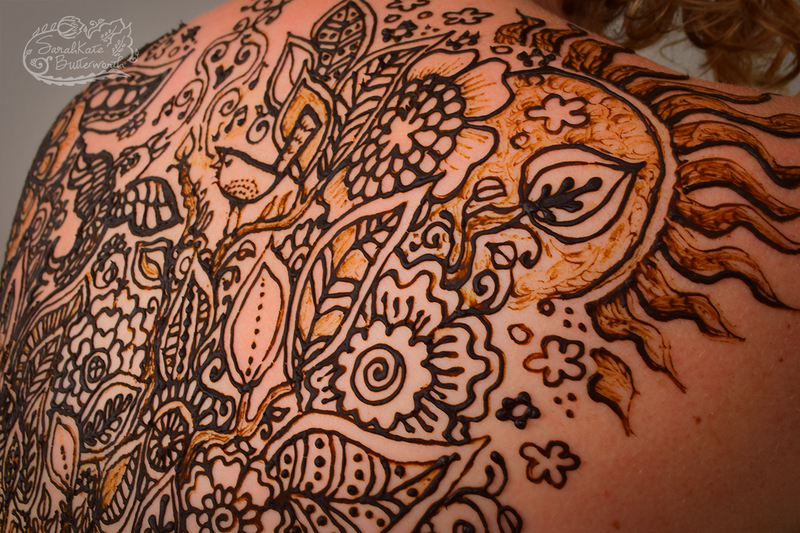 Henna paste should sit on the skin for several hours before it is rubbed off & oiled (with edible oil). 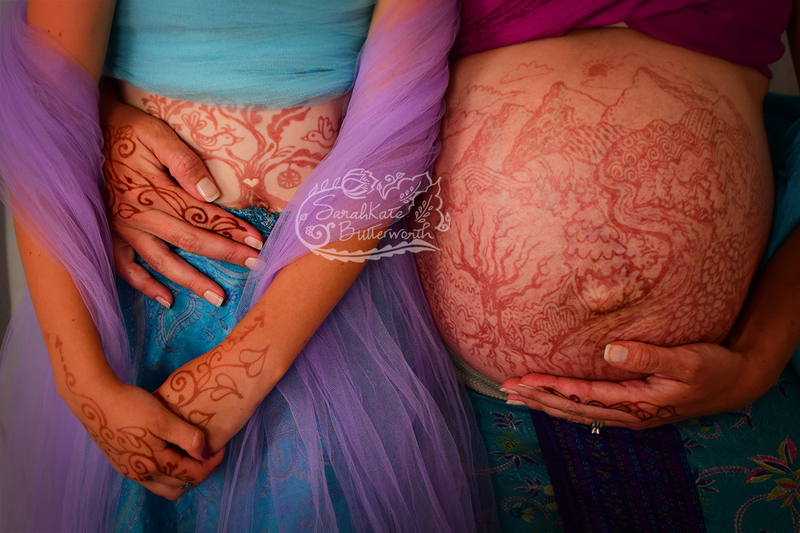 Sara was just 1 day away from her due date when I hennaed her belly with a kind of floral zendoodle. 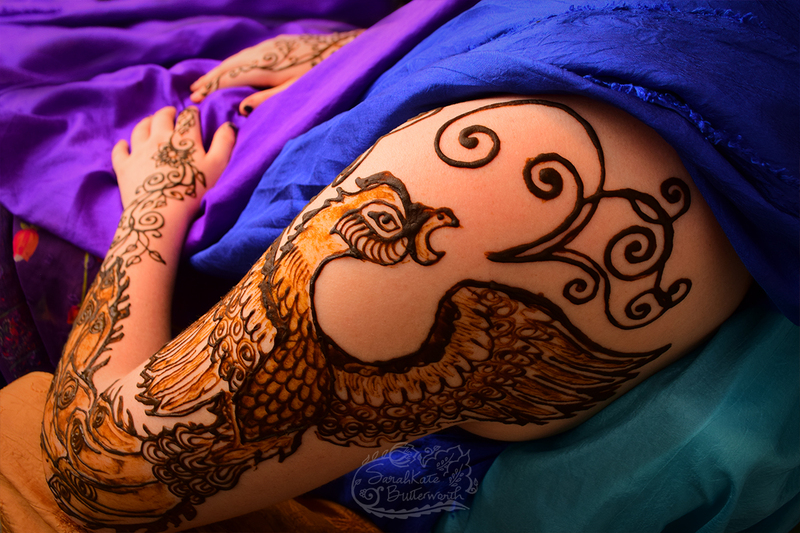 The night before I adorned Sara, I had covered myself in henna in celebration of Mother's Day. I had taken off my henna that morning to reveal this beautiful shade of bright orange. I have had the incredible blessing of being Momma to three beautiful daughters & Nana to our twin grandsons - and I love to recognize my blessing with henna each year. Our oldest daughter, Aleah, lives with her family in Alaska and we were so happy to have her & her twins over for the holidays this past winter. Of course, I had to give her henna when she was pregnant! She gave birth shortly afterwards - the photo from 2015 shows the boys at 3 days old. The photo from 2018 was from the holiday visit... I'm so grateful for family! Rob took this photo, but really, he should be in it too. On Mother's Day I was part of several Mother-daughter celebrations & other festivities, and my husband caught me on camera here. I love the way henna looks on my skin, it's the perfect color tattoo. A few days later we did some Mother Daughter photos of our own, and I wanted to share this one of Laurel and I. In May she graduated from Boulder High School and this fall she will live in the dorms at CU. We are so proud of her and excited for the next chapter of her journey. Our youngest daughter still has 3 more years of high school, and these last few years feel precious. 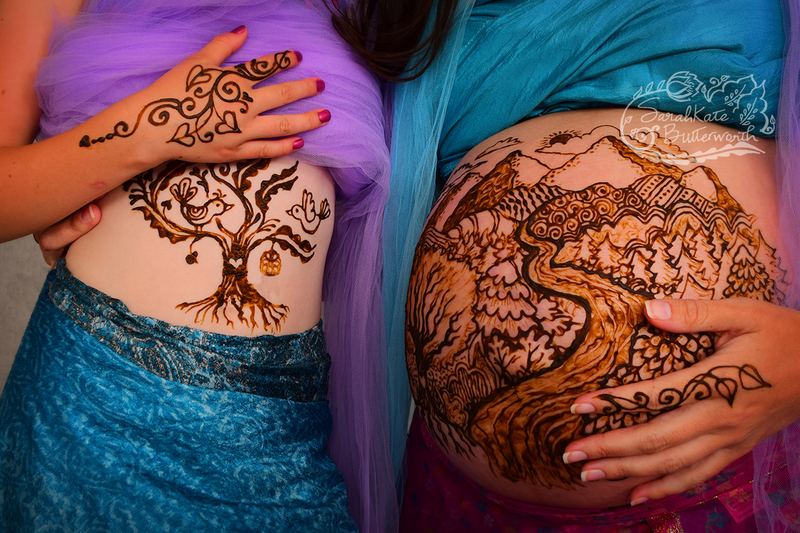 Sara didn't come back for more photos while her henna was peaking in color, instead, she was busy giving birth. I am so grateful for this photos she sent me of her newborn laying on her hennaed belly. It feels like a wonderful blessing to give birth adorned with henna. What a cutie! Mother daughter henna! I love it when girls want to celebrate with their mom. This young lady wanted a tree, two birds, and a dream catcher. Mama requested a flowing river and mountains. I have had the most wonderful time adorning this mama and her daughters! Yesterday I spend about 3 hours working on the mama, down both arms and across the chest, incorporating requests for columbine flowers. Her daughters came today, and I spent about 1 1/2 hours on each, incorporating their spirit animals. I really love hearing about why kids like certain animals, feeling that energy in them, and artistically representing that on their skin. The older daughter chose birds of prey, which we ended up having owl & phoenix represent. The younger daughter had a long list of sea creatures she adored, and after hearing her requests I incorporated a whale, turtle, octopus & otter. I love how they are just swimming down her arms. Doing the kind of work I do with pregnant women, I hear so many incredible stories. When Kelly sat in my chair and shared hers, I was really blown away by her love and patience. She requested her design incorporate her daughter, her unborn baby boy, and her 4 miscarriages - all with birds. After I had completed the design I stared in wonder at what looked like a rainbow behind the birds - I hadn't intended on incorporating this symbol, but it just came through anyway (rainbow-babies are babies conceived after a miscarriages). 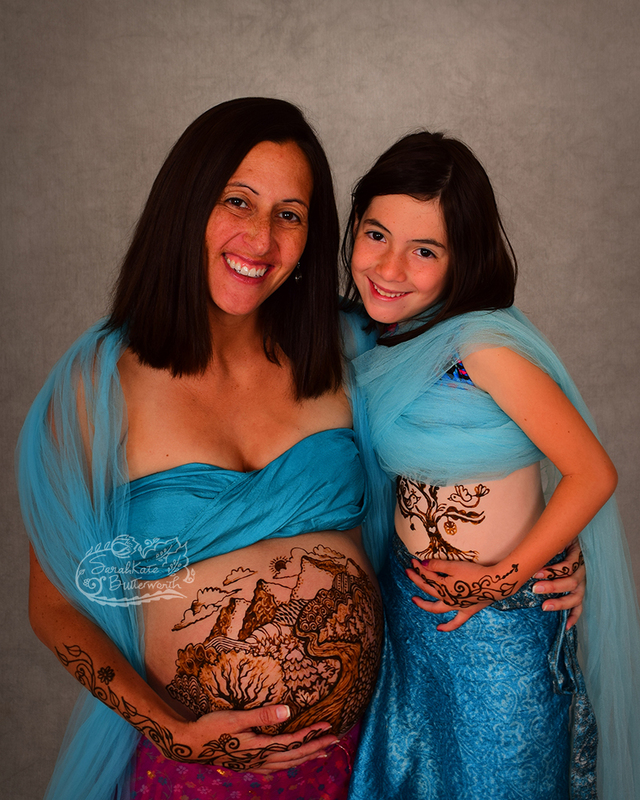 Her daughter came along with her for the photo session when the henna was peaking and got some great photos of them together! Her mothering journey was remarkable, especially in that she found the support she needed. Her baby boy was born healthy and I was thrilled to see them both after the birth & share in her happiness for his safe arrival. Read all about the resources she found! One thing women tell me is that miscarriage is not talked about enough, and so this issue delves into the stories of several mothers sharing about how they have processed this grief. Artfull Mother Magazine is both a digital and print magazine! All 13 issues are up on the website and available to read for FREE. Check here, on my Pinterest boards, for ways to get print copies. What I love about henna is the language of symbols, and the power of marking a person's body with them. They don't have to be complicated or rooted in an ancient text - a blossoming lotus mirrors a blossoming in your own life. The stripes of a tiger remind you of your inner Cat, powerful and graceful. And the moon.... the moon feels inherently feminine. For this photo session, we sat with the trees, embracing the beauty & the fierce presence of the She Tiger. .